ECOSTRESS will give us new insights into plant health by quantifying the temperature of plants from space as never before, measuring regions as small as 230 feet (70 meters) on a side, or about the size of a small farm. It will do this by estimating how much water plants are releasing to cool themselves (i.e., evapotranspiration—the equivalent of sweating in humans). This will tell us how much water different plants use and need, and how they react to environmental stresses caused by water shortages. ECOSTRESS will estimate how much water moves through and out of plants by tracking how the temperatures of plants change. The data from its minimum one-year mission will be used by ecologists, hydrologists, agriculturalists, meteorologists and other scientists. It shows a version of this image, but I've found a higher resolution version at the JPL ECOSTRESS mission page. Question: I don't understand much of what I'm looking at here. 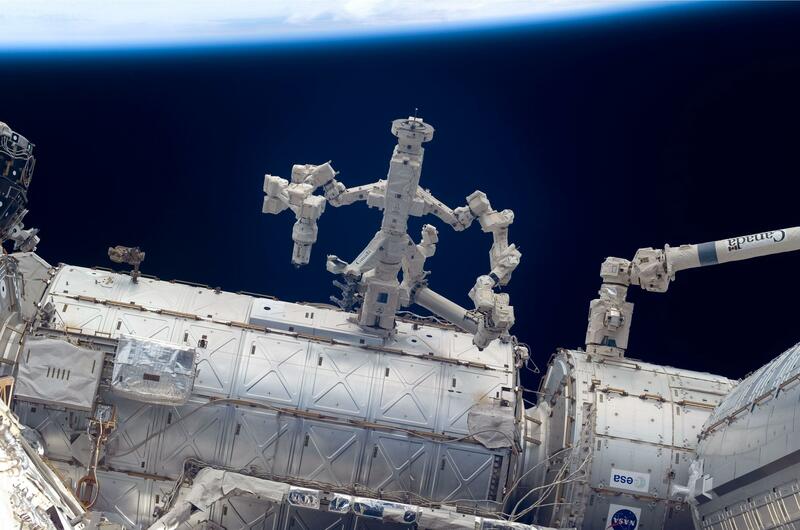 On the left the long arm looks like the Mobile Servicing System or MSS and on the left the tangle of joints could be the Special Purpose Dexterous Manipulator (SPDM) or DEXTRE, but near the bottom on the right there are some long, straight segments that look like another MSS. Are there two? below: "Figure 1. 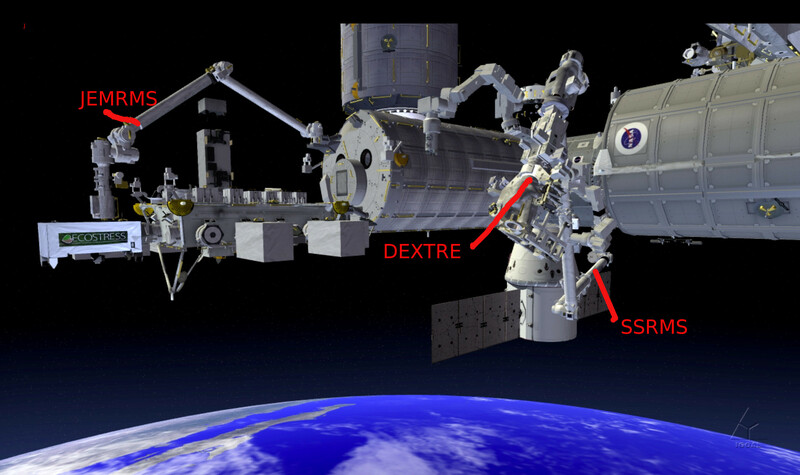 Japanese Experiment Module (colored white) on International Space Station" From here. Click for full size. The SPDM is pretty complicated having two arms of its own, a rotatable waist joint, tool platforms, etc. 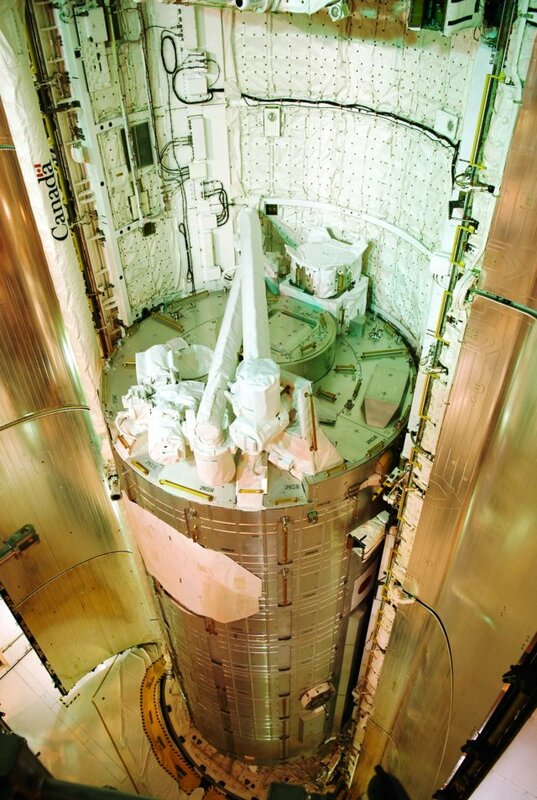 In your picture, the SSRMS is holding the SPDM. The picture below shows it parked. Looks like you were missing the JEMRMS mostly. You can read about it here. It can actually pick up an additional small RMS, the Small Fine Arm. But in your picture it's simply grappled to a payload. The JEMRMS is conceptually more like the Shuttle arm than it is like the SSRMS. The JEMRMS was launched pre-installed on the JEM on the STS-124 shuttle mission. You can see it here in the payload bay prior to the doors being closed. Not the answer you're looking for? Browse other questions tagged iss robotics robotic-arm or ask your own question. How many robots have been at, in, or on the ISS? How many different walk-off maneuvers can the ISS robotic arm do? What are robot arm singularities in the context of the Space Shuttle and/or ISS?